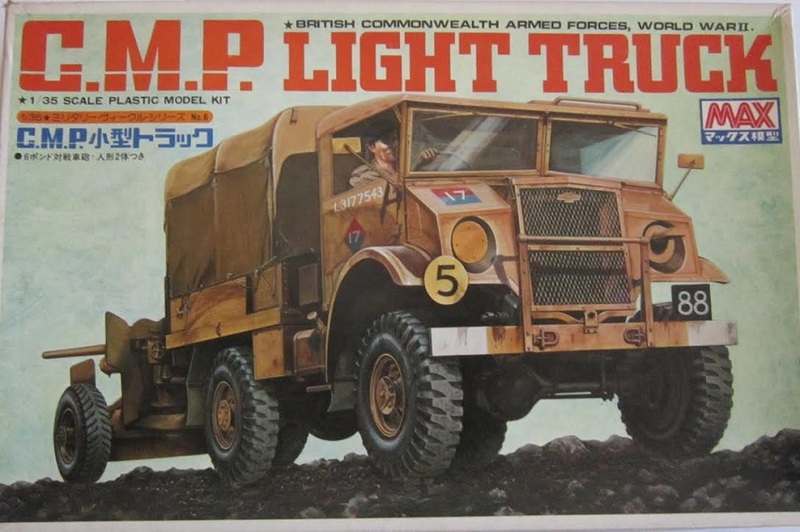 The Canadian Military Pattern (CMP) truck was a class of military truck - of various forms - made in large numbers in Canada during World War II to British Armyspecifications for use in the armies of the British Commonwealth allies. 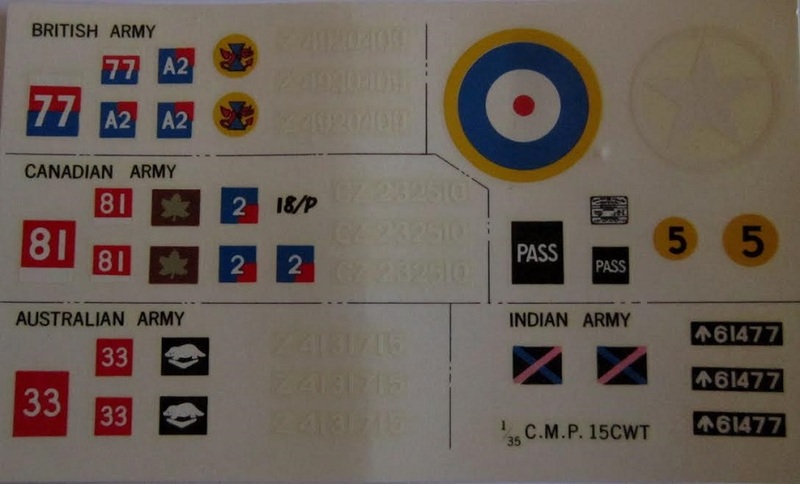 Standard designs were drawn up just before the beginning of the war. CMP trucks were also sent to the Soviet Union following the Nazi invasion of Russia, as part of Canada's lend-lease program to the Allies. During the War CMP trucks saw service around the world in the North African Campaign, the Allied invasion of Sicily, the Italian Campaign, the Russian Front, the Burma Campaign, theBattle of the Philippines (1941–42), the liberation of Northwest Europe, and the Western Allied invasion of Germany. CMP trucks also saw service in post-war conflicts in Indonesia, French Indochina, and the Portuguese colonies in Africa. Max was a model company based in Japan that went out of business. Their U..S. importer was Peerless in Philadelphia, PA, that also went out of business. Max’s molds went to a lot of different companies and usually appeared in the same original box art with them. This kit came in a shrink-wrapped tray and lid type box with a sturdy tray. The box art shows a C.M.P. truck in overall tan. It has the white serial no. L3177543 on the doors of the cab over a diamond that the top half is red and the bottom half is blue with a white number 17 on it. This mark is repeated on the front, but as a square shape and not a diamond. Attached to the left front fender is a yellow disc with a black number 5 on it. On the right front fender is a black plate with a white number 88 on it. The ends of the bumper are white. The truck is pulling a 6 pdr howitzer. One side panel of the box has 2 color photos of the model made up. One photo shows it in a “MOUSE EAR” type camouflage that is black over a base of tan. 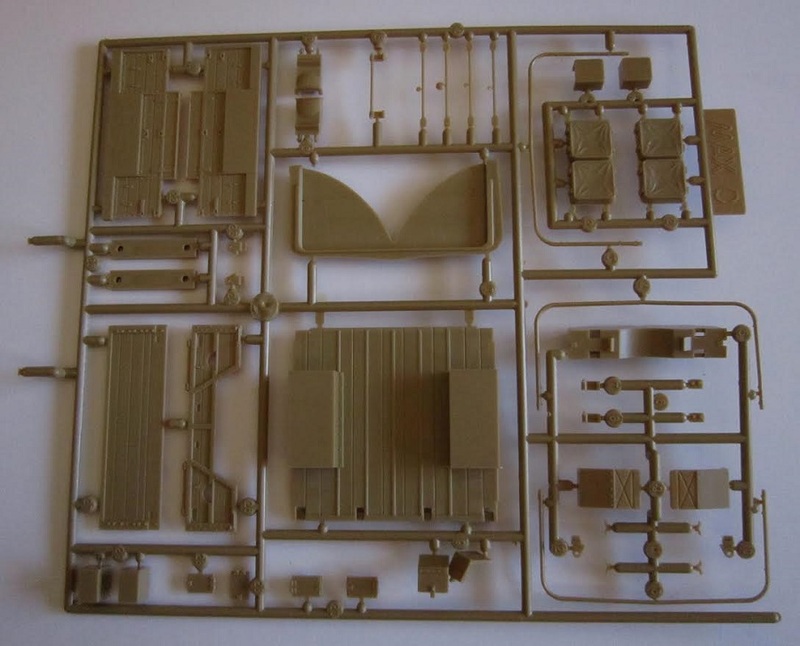 The second model is overall tan and showing the back of the truck and the 6 pdr. A third photo shows the 3 figures in the kit, standing next to rifles that are leaning against a pile of rolled tarps. The figures appear to be one each British, Australian and Indian,. 2. Kit no. 3505, a Dodge ¾ ton command and reconnaissance truck. 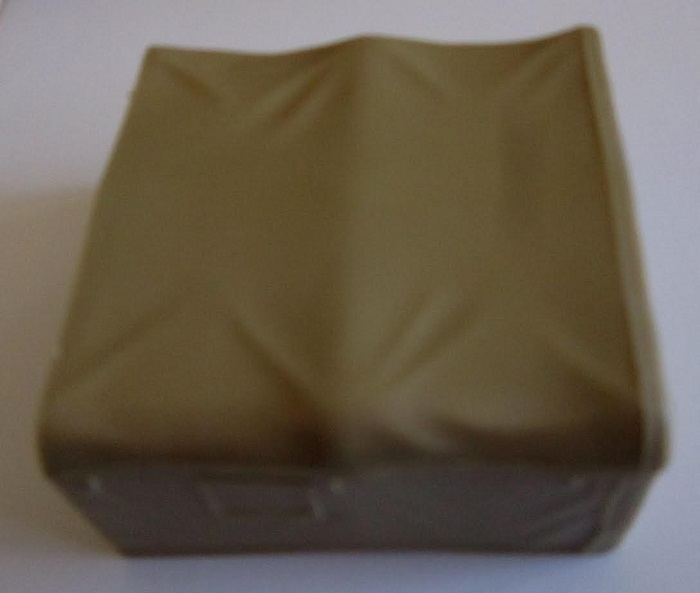 This kit contains 5 tan parts trees in 3 stapled shut cello bags, a loose tan canvas roof part, 2 metal rods, the decal sheet, assembly instructions and a booklet of the history of the truck. The instructions consist of a single sheet that accordion folds out into 8 pages in 8” x 11 ½” page format. The text in it is all Japanese. Page 1 of the assembly instructions begins with a black and white photo of the truck, gun and figures made up, followed by Japanese text and 2 black and white photos showing both sides of an actual C.M.P. truck. Page 2 through page 7 give a grand total of 13 assembly steps. Steps 1 to 9are for the truck. Steps 10 to 12 are for the gun and step 13 is for the figures. Page 8 has four 4-views. Two are in overall tan and two are in “Mouse Ear” camouflage. The text is all in Japanese, so I cannot say any unit names that might appear here. Me no read Japanese. The history booklet consists of a single sheet folded in the center to form 4 pages also in 8” x 11 ½” format. The text again is all in Japanese and there are no less than 24 black and white wartime photos of the C.M.P. truck and variants of it. The single tan canvas roof part is next. 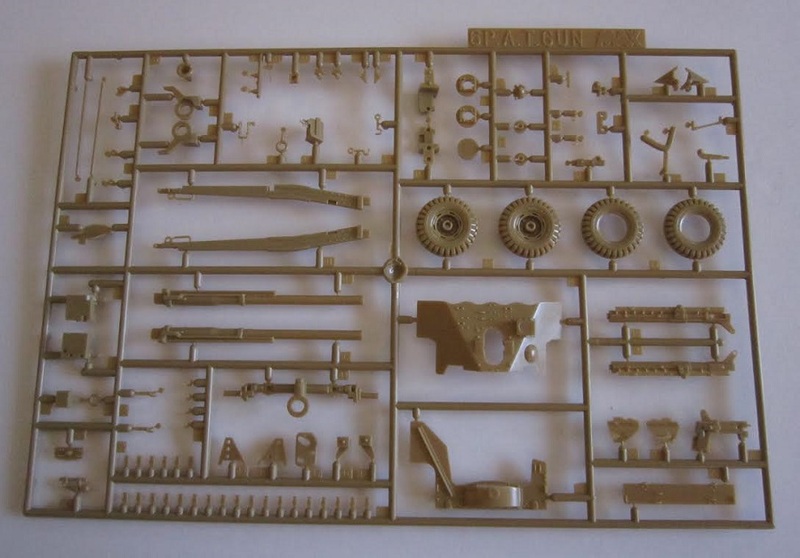 A tan un-alphabetized tree holds all the parts for the 6 pdr howitzer. (98 parts). 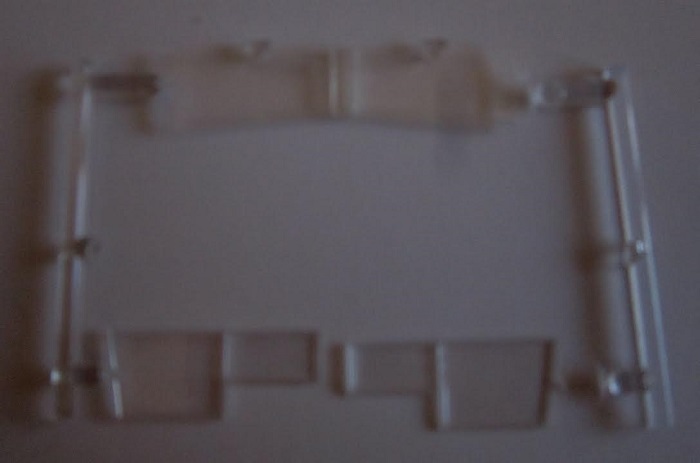 The clear parts tree hold 3 window panes. 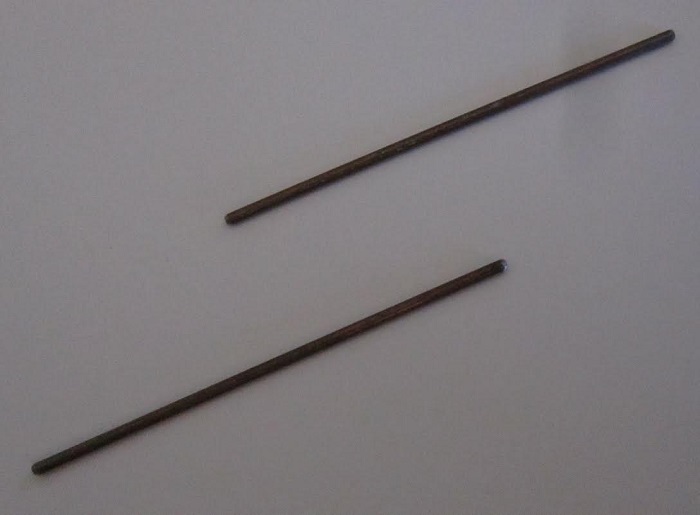 There are 2 steel rods in the kit to put into axles to strengthen them. The decal sheet completes the kits parts. 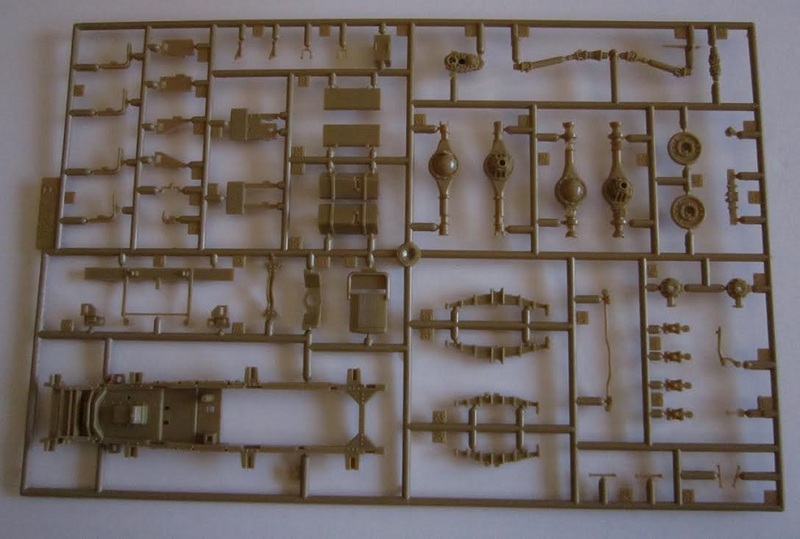 This is a very detailed and neat kit. It has a full engine in it, that I have assembled so far as the only building done so far. I recommend it to modelers of advanced building skills, due to it’s part count and complexity. It is not for the novice modeler and not a weekend project. Kit was courtesy of my wallet back in the 70’s. It may be found on the internet someplace perhaps under one of the brands that remarketed the kit years later. Peerless-Max first released this model in 1970’s and 1976 as kit no. 3508 in the same box art. 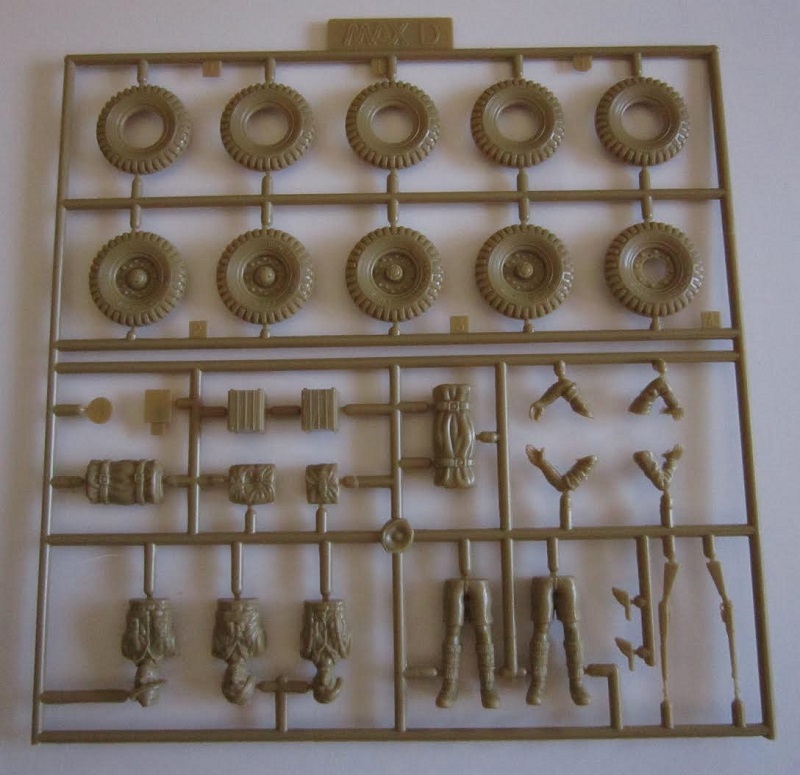 Then it was re-released by Airfix in the same box art, but with some new parts as kit no. 08367-4 in 1977. Italeri re-released it as kit no. 233 with a new box art in 1986. Testors-Italeri did yet another new box art for it and re-released it with new box art as a unknown kit no. also in 1980/s.. Tomy also re-released it with new box art in the 1980’s. Bilek re-released it in new box art as kit no. 992 in the 1990’s. Finally, Italeri re-released it again as kit no. 6233 in a new box art in 2007. So it might still be found around for sale in one of these re-releases..